Pixar Studio’s latest feature, Inside Out is a blast from the Studio’s celebrated past. For many years Pixar and I had a ritual, where in late winter I would start counting down the days to the traditional early summer release of that year’s film. Often during this period I would be questioning whether “they” had pushed the subject matter envelope too far. Is a film with a name they have to tell you how to pronounce and a story of a rat who wants to be a chef really going to work? Likewise, is a film about the world’s last functioning garbage robot, a film that is also virtually silent really going to be worthy of time and attention? And, will an odd-couple film about an old man and young boy who travel by a floating house really be worthy of an adventure to theater? After seeing each of these films, Ratatouille, Wall-e and Up I chastised myself doubting the company that had never disappointed. Prior to the release of Cars 2 I suspended such questioning and for the first time was disappointed. Likewise Brave was, in my mind, ordinary at best. In the rollout of the Inside Out, I again had serious doubts as to whether this film would be meh or memorable? 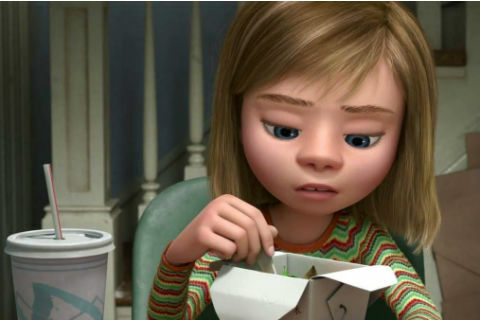 Thankfully Inside Out has that old Pixar magic. I was fortunate enough to see it as it premiered at The Cannes Film Festival where the viewers are notorious for demonstrably expressing their negative opinions and reactions, often during the film. 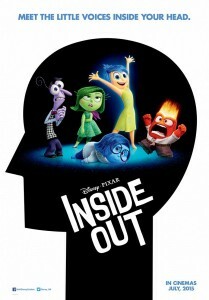 Inside Out was among the most well received films during the festival, and deservedly so. While Pixar has always produced visually stunning films, what made their films truly special was that the stories spoke to both children and adults. Inside Out succeeds in this difficult challenge. Inside Out reflects what every child has experienced, emotional responses to the positive and negative experiences of life. Likewise, time and again, every parent has wondered, usually during an emotional explosion, what was going on in their child’s mind. Inside Out goes where few dare tread, the emotions of a child as she grows and works through the biggest of childhood challenges, moving from a happy home town to a vastly new and different place. 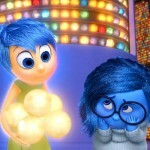 In making the film, writer, director Pete Docter set out to examine human emotions. He does so by depicting five emotions as characters. Amy Poehler, Bill Hader, Lewis Black, Mindy Kaling, and Phillis Smith star as Joy, Fear, Anger, Disgust, and Sadness who live and work in “Headquarters,” the mind of a girl named Riley, where they are responsible for keeping her functioning as she grows from an infant through adolescence. Thankfully, Joy is the primary emotion and is generally in control of Headquarters and Riley’s responses to life. As Riley grows, Joy’s main job becomes keeping Sadness from doing much of anything as everything she touches turns blue, literally and figuratively. While all the emotions have their turn at literally pressing Riley’s buttons, it is Sadness who Joy, and the others have to watch out for as her’s has the most impactful, long lasting touch. The film moves quickly though Riley’s childhood showing her responses, and those of her parents as she grows from a newborn into a preteen. In addition to guiding her through incidents and everyday life, the emotions also play an important role in keeping her memories that will establish and maintain her core values, those elements that will shape and guide her the rest of her life. Everything is going swimmingly in Riley’s life, and for the film’s characters as Riley is smart, friendly, and a successful hockey player. All of that changes when the family moves from idyllic Minnesota to San Francisco as her father chases his dream of leading a silicon startup company. As with most teens forced to move from a happy situation, nothing about the new city measures up. The new house, new friends, and even new family time and activities pale in comparison to “home.” It seems as if Riley’s personality, happiness, and even her hockey skills were left behind and replaced by awkwardness, uncertainty, isolation, and failure. For the first time Joy and the other emotions seem helpless to control the situation and keep Riley, Riley. The once happily contented child is changing before her parent’s, and the emotions’ eyes. What once were her bedrock memories and foundational parts of her identity literally begin to crumble. The second half of the film depicts Joy’s and Sadness’s struggle to get back into “Headquarters” after they are accidently moved to another part of Riley’s mind, all while Riley’s world seems to be falling apart. It is in this struggle that Joy, the other emotions, and the audience learn the important fact that all of one’s emotions have a purpose and are important. While people would rather be joyful all the time, since there is no such thing as a perfect world, such is not possible. Yet, for many, it is hard to accept this reality as well as the consequence, that one cannot always be in a state of joy or happiness. As with disobedient children, and adults, where the cover up is often worse than the offense, the attempt to live in and or project to others, joy and happiness while in the midst of difficulty or despair, is often worse than the precipitating events of life’s challenges. Too often individuals and families, fueled by societal expectations, seek to put on a good face regardless of the difficulties and challenges in life. To show sadness, anger, or fear is considered by many a weakness, or a burden to others, and is too often a societal “no-no.” Such airs also have negative consequences for individuals and families. Denying and struggling against the times that are other than joyous adds pressure to one’s life and can foster a cycle that results in increased unhappiness which then leads to greater pressure to remain or at least project joy or happiness that then yields even greater dissatisfaction and more pressure. Such denial of events and resulting emotions are also a fearful and non-faithful response to life’s trials and difficulty. The Book of Ecclesiastes famously reminds readers that there are different seasons in life. There are times to sing, and dance and there are times to cry and mourn. There is a time to live and there is a time to die. Christ echoed this reality when he taught that there will be times when the sun shines and times when rain falls, and there will be times when the righteous will suffer and the unrighteous flourish. Even when living faithful, discipled lives, there are times one spends in the garden, on the cross, in the tomb, and a time for resurrection. Each of these times or seasons yields emotions that are important in living in and through the seasons. The life example of Jesus shows a variety of emotions as he lives and ministers in the midst of different seasons. In reading the Gospel accounts of Jesus’s ministry, one senses Jesus experiencing joy in the midst of serving and ministering to the lost and forgotten people who had been pushed to the margins of society. Jesus demonstrated anger toward leaders who abused the privileged of their position and allowed profiteering in the Temple. Jesus was fearful in the garden and saddened when in the presence of Lazarus’s mourners. Christ did not avoid living in, and showing, his emotions in the midst of life and circumstances as he knew God was eternally present and faithful. Inside Out teaches children of all ages, including parents, that all of our emotions are important and have a place and function in living lives of meaning and fulfillment. 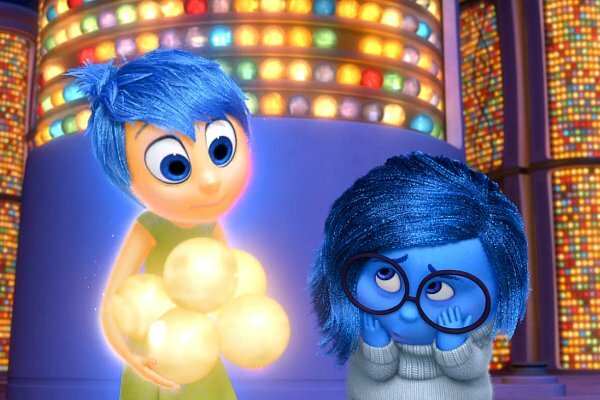 In addition to teaching generally about the presence and purpose of emotions, Inside Out could be of useful tool in teaching children with autism or other developmentally delayed conditions that have difficulty recognizing and understanding the nuances of emotions in themselves and others. It is important for all to understand that emotions are a part of us, and when properly expressed and utilized, are tools given by God that equip us for living life in a broken world, and they are also signs of God’s faithfulness and eternal presence. This entry was posted in Faith Shots, Film Shots and tagged Amy Poehler, anger, autism, Bill Hader, developmental delay, disgust, emotions, faith and film, Inside Ou, Inside Out Film, jesus, joy, Pete Docter, Pixar, sadness, teaching children with Autism. Bookmark the permalink. What a wonderful review of this movie–and one I will now see, thanks to you. So appreciate the work you do with this unique calling. Thanks so much Christy. I admire very much your writing.